Have you watched these videos of our beloved Returning Officer, Mr Yam Ah Mee *screams like a teenage youth (Oh wait. I am. )* announcing the Announcement of Results On Nomination Day, & Presidential Election Results? 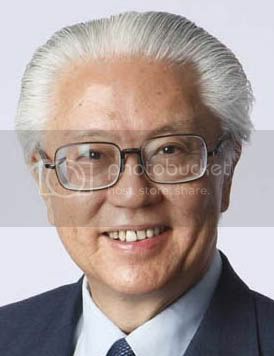 Pursuant to Section 32, Sub-Section 8D Paragraph A, of the Presidential Election Act, I declare Tony Tan Keng Yam as the candidate elected﻿ as the President of Singapore. Check out the much awaited Presidential Club Mix. You should see the way he danced - too cute & funny! Anyway, this is Singapore's new President, Mr Tony Tan. Seriously speaking, I don't know much about him. I read from the news that he resigned his jobs just to run for President. Asked my mum more about him, & she was like: "Aiyah, he sure win one lah. He is closely related to the PAP and was involved in a lot of political-related stuff before." I thought that hey, does that mean that he already has many people who loves him? I got quite a shock when I saw how displeased many people were about his win after the election results were announced though. We all saw how he ignored the reporter May Wong on CNA. I also found out that the Lee family were his relatives, so Singapore's more or less under their 'control'. And that his Mandarin is.. Well.. Bad. Whatever it is, we can't change the fact that he is the President. Let's just hope that he does a good job in serving Singapore for the next 6 years. Ps, he looks like Mr KFC, doesn't he! ?